After countless homeownership horror stories, the government has woken with a flurry of consultations into how to go about fixing property related problems. Here we look at the latest review of redress schemes aimed at helping consumers to help when things go wrong. Typical isn’t it – you wait ages for a consultation and then they all come at once. Yes, the government seems to have gotten a little overzealous on the consultation front of late with home related consultations launching on a monthly basis. Then, following communities secretary Sajid Javid’s announcement late last year that he was to look at the current complaints and redress system in the housing market, the government announced the launch of an eight-week consultation into the issue. Just days later the Law Commission published a Call for Evidence on Commonhold, asking why very few have been adopted in the last 10 years or so since they’ve been an option. Not to mention the government’s call for evidence to improve the UK’s (but not Scotland’s) chaotic homebuying system. Despite the current cavalier approach to starting consultations left, right and centre, those focused on the property sector are actually long overdue and very much needed. But it is critical that we continue to keep the pressure on government to take action as a result of these consultations. Here we look at the live consultation on strengthening the consumer redress in housing. Strengthening the redress scheme for consumers is something we have been calling for for some time. At present, homeowners and tenants have to navigate a complex network of property-related ombudsmen, depending on the nature of their complaint. There are three ombudsman set up to help: The Property Ombudsman, Ombudsman Services Property (to be dissolved later this year) and The Property Redress Scheme, and which one you use depends on who your complaint is about. And if your complaint is about your new build home, you have to follow different procedures set out out in one of the seven consumer codes or go to the Financial Ombudsman as if your complaint is about the warranty provider. The point of this consultation then is to make it easier for homeowners and tenants to complain about poor treatment with the main proposal from the government to set up a single property ombudsman. 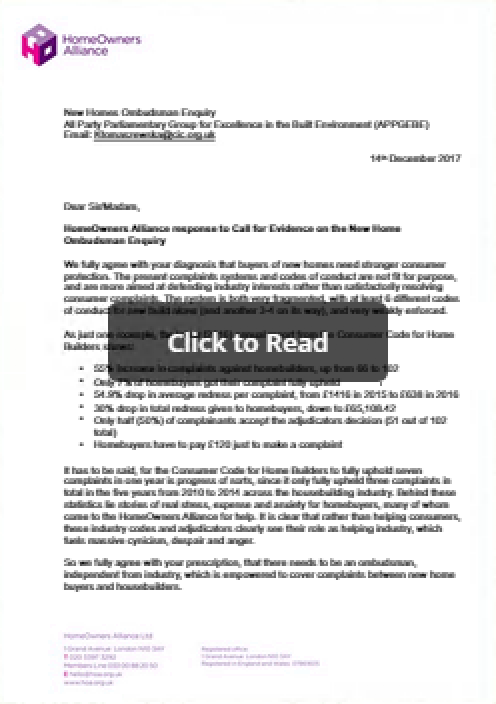 We fully agree with the government prescription that there needs to be an ombudsman, independent from industry, which is empowered to cover complaints between new homebuyers and housebuilders. However, we disagree that the best way to do this is to set up a dedicated New Homes Ombudsman and we are pleased to see that government is listening to us. We have real concerns that industry see a new home ombudsman as inevitable and are already planning to “capture” it to ensure it is not too independent, possibly by pre-emptively establishing one of their own to ensure that a properly independent one is not set up. There is a very high risk that a new New Homes Ombudsman would end up being designed to meet industry’s needs, not consumers’ needs. We think it would be much better to widen the remit of an existing ombudsman – and in particular, the Property Ombudsman, and give it statutory powers similar to the Financial Ombudsman. Read more about why we think this is the best way forward here in our response to last year’s All Party Parliamentary Group for Excellence in the Built Environment inquiry. We would love to hear what you think to help inform our response to government. Or you may wish to engage directly with government. See the government site for more details. The consultation closes on Monday 16th April.